This entry was posted in Books and tagged American literature, John Steinbeck, The Red Pony by Katrina. Bookmark the permalink. 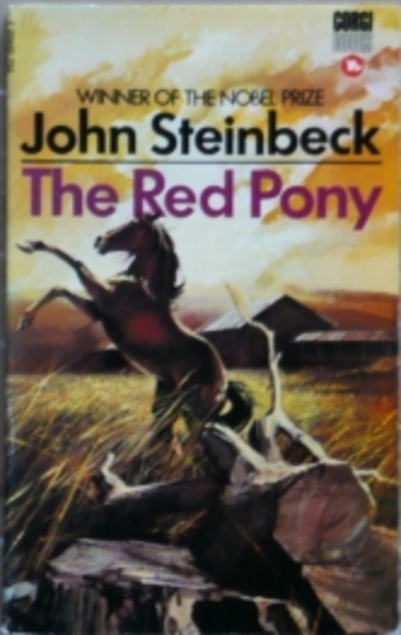 Oh my gosh–Steinbeck’s The Red Pony. It was assigned reading in my seventh grade English class. (I was 12 years old.) I could not bear the unrelenting sadness when the child’s pony died. I really couldn’t. I was very sad over that book. I was too young. But, you know, even as an adult, I would not choose to read such a sad book. I’m particular about my animal stories. I have nothing against Steinbeck, of course. I hope it didn’t come across that that was my complaint. No I never thought for a moment that you had a ‘down’ on Steinbeck, I must admit I agree with your mother, it’s definitely not a choice for children. I thought the other tale about the emergency horse caesarean was even worse- brutality wise. I know that things like that happen to animals, here if a cow is having trouble getting a calf out (it being just too big) they choose the cow over the calf and get the cheese wire out! I only learned of that last year. Animal breeding can be horrible. You know I don’t remember a thing about the horse caesarean! I probably blocked it out of my mind—. Yes, animal husbandry is a very, very rough profession. I hope to block it out – soon! It was the birth of the replacement foal and of course the mare was sacrificed.